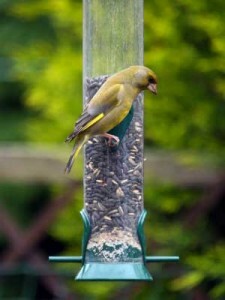 Greenfinches, parasites, heat islands and the BTO nesting survey. Greenfinches are being killed by a protozoan parasite – Trichomonas. The parasite causes swelling of the throat by infecting the crop and gullet, so the the birds cannot eat. It has been suggested that as many as 500,000 greenfinches have been killed by this parasite. In order to help control this contagious protozoan (= a single celled animal), it is important that bird feeders and baths are regularly cleaned. Wet weather also helps the parasite. The Scottish Agricultural College has warned that another parasite Salmonella, can be a problem at feeders, drinkers and baths , affecting particularly sparrows and greenfinches. Salmonella is a bacterium and it can cause disease in humans and their pets. After cleaning bird feeders, drinkers and baths, it is important to wash and dry the hands thoroughly to reduce the risk of onward transmission. If there are several feeding, drinking or bathing sites in a garden, then the numbers of birds in any one place is reduced and the risk of disease lowered. If dead birds are found, then it might be wise to clean all feeding stations and stop feeding for a while; this encourages the birds to disperse and reduces the risk of infection. Feeding can then be gradually re-introduced after a break of some two weeks. The British Trust for Ornithology (BTO) shortest day survey carried out in conjunction with “Today” on Radio 4 has reported that urban birds arrive later to feed at bird tables than their rural counterparts. This is probably due to the ‘urban heat island effect’. At night, the brick and concrete of the buildings acts as a store of heat energy and slowly releases heat energy into the surrounding environment. Cold winter nights mean that small birds use up a lot of energy just to maintain their body temperature. Consequently soon after first light, they are on the move to find food to replenish the energy stores used during the night. In towns and cities, the ‘heat island effect’ means that the temperature can be several degrees higher and this ‘extra heat’ means that the birds can get through the night more easily than their country cousins. The BTO is organising the Garden Nesting Survey for this year – which will run through the next few months. If you would like to be involved then you can sign up for the project here. You will receive an A2 wallchart that will help you identify the nest and eggs of the most common garden birds. The information collected will help form a picture of which birds are nesting in gardens and their breeding success.